Donald Sterling is banned for life from the NBA for his recorded racism, but his record of housing discrimination that should have drawn the anger of fans, players, coaches and the league long ago. PORTLAND, Ore. (TheStreet) -- Donald Sterling would love the part of Northern New Jersey I once called home. My family came from Newark but moved to the suburb of Belleville just to the city's north in the early 1950s. Right around that time, the Federal Housing Authority broke out its pen and redlined much of Newark city proper and refused to invest in mortgages or home improvement loans anywhere within the city. However, the FHA had no problem backing mortgages in suburbs like Belleville, Nutley and Bloomfield and used its powers of persuasion to lure folks out of the city and into recently converted patches of marsh and farmland. The white population of Newark dropped from 363,000 to 266,000 in the 1950s alone. Manufacturing and service jobs followed and left a poor population jobless and confined to either dilapidated homes owned by absentee landlords or large-scale public housing projects that helped give the city its nickname: Brick City. By the time the Newark riots/rebellion took place in 1967, the city's white population had dwindled to just 46,000. National Basketball Association Commissioner Adam Silver banned Sterling, the owner of the Los Angeles Clippers, from basketball for life and fined him $2.5 million for telling his mistress not to have her picture taken with black men, but it was Sterling's other gig as a Los Angeles slumlord (or "real estate mogul," if you'd prefer) that cemented the legacy of his post-World War II-vintage racism. His words cost him support of sponsors including Anheuser-Busch InBev (BUD, Carmax (KMX - Get Report), Sprint (S - Get Report) and Virgin America before ultimately costing him NBA franchise, but his actions as a discriminatory and repulsively prejudiced property owner cost minority families and the city of Los Angeles so much more. New Jersey folk stories told by older generations insist that it was the unrest in Newark, Plainfield, Asbury Park and elsewhere in the late 1960s that led to white flight from the state's urban centers. In truth, the process began with the economic shift toward the suburbs well before then and the discriminatory real estate and lending practices that made it possible. It's the reason that Route 22 out of Newark into Union County is dotted with once Newark-based paint stores and Spanish restaurants. It's why a Paterson food market has a secondary location in the green, sprawling western suburbs along Route 46. Paterson itself is covered by a newspaper that overlooks it from a hill in an adjacent suburb that changed its name from West Paterson to Woodland Park -- largely because its citizens would rather live in what sounds like a cemetery than associate with the city that they and their parents left behind. That red line dissects cities, neighborhoods, classes, races and ethnicities, and Donald Sterling used his red marker with surgical precision. When he was sued for discrimination in 2003, employees said he laid down rules for each of his properties: no blacks, no Mexican-Americans, no children and no government-housing-subsidy recipients as tenants. His own property supervisor testified that Sterling said he didn't want black tenants because "they smell, they're not clean" and that he refused Mexican tenants because they "just sit around and smoke and drink all day." According to the testimony of tenants, those who fit the above descriptions would have their rent checks refused, only to be accused of nonpayment. Sterling would refuse to schedule inspections for black tenants but had his employees pop in for surprise inspections and threatening them with eviction for violation of building rules. That case resulted in a settlement that cost Sterling $4.9 million just to pay the plaintiffs' legal fees. 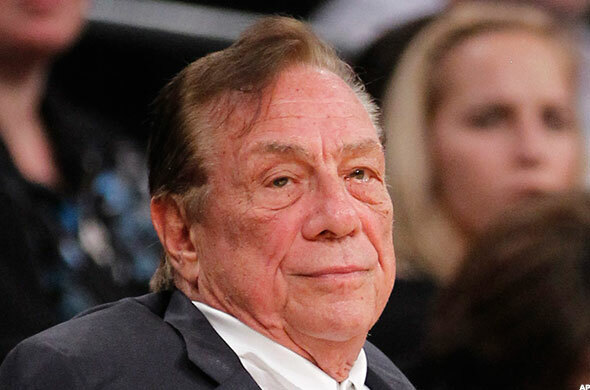 In 2009, Sterling was forced to pay $2.75 million to settle claims that he discriminated against African Americans, Hispanics and families with children at his Los Angeles properties. Sterling took great pains to make it clear that he prefered Korean tenants for his buildings, saying in sworn testimony that "I don't have to spend any more money on them, they will take whatever conditions I give them and still pay the rent." He even went so far as to rename one of his buildings Korean World Towers and spell out its name entirely in Korean. At the time, it was the largest housing discrimination settlement of its kind. When the NBA announced Sterling's expulsion, however, it didn't rate so much as a mention at the commissioner's press conference. How? Sterling's words of warning to his mistress about not having her picture taken with Magic Johnson and Matt Kemp had the tabloid appeal and salacious detail, but Sterling's actions against tenants in Los Angeles had lasting impact. More than half a century after redlining drew literal divisions between haves and have nots and partitioned U.S. citizens based on race, class and income, Sterling continued tracing those lines -- to his city's detriment. The owner of a team that wears the Los Angeles name had done everything in his power to not only divide his city, but to close doors to its residents based on race, ethnicity and income and sow seeds of financial and social inequality wherever his name was on a deed. It's what ESPN columnist Bomani Jones tried to tell readers about Sterling in 2006 and why he was furious that it was all but ignored amid the latest furor surrounding Sterling. His abuse of power and his racism's influence over the most basic elements of people's lives -- where they live and where they work -- is what matters. It's the institutional racism that shapes who we are, what our neighborhoods look like, how we interact with each other, who wins, who loses and what we're all going to become. In New Jersey, my family members still curse Mayor Hugh Addonizo for cynically grabbing for federal money under the guise of improving public housing and tearing out the 15-block heart of Newark's immigrant-heavy First Ward to build the oversized, poorly constructed and perpetually neglected Columbus Homes housing projects. This was the same mayor who not only sat behind the desk while his city burned in 1967, but had the audacity to destroy a huge swath of the predominantly black Central Ward to build the University of Medicine and Dentistry of New Jersey. His tenure saw families pushed out of the city, forced into its neglected corners and bulldozed out of the way for the neighborhood-scarring interstates 78 and 280. When most residents of the New Jersey suburbs pass through Newark now, it tends to be on one of those roads high above the city below. Addonizo was convicted of corruption after leaving office and is rightly remembered as a greedy, divisive monster whose legacy Newark is still trying to escape. Donald Sterling will always be linked with the racism that exiled him from the NBA, but that racism's greater impact on the city of Los Angeles and the NBA's complicity in his crimes should be remembered at least as well as the name of the website that brought about his downfall.